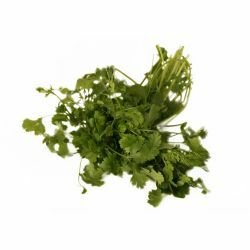 Coriander (Coriandrum sativum) is also known as cilantro, dhanyaka, Mexican parsley and Chinese parsley and is a member of the carrot family. It is native of the Middle East and grows between one and three feet bearing purple-tinged or white flowers and feathery leaves. Coriander is one of the most ancient herbs still used today and has been used for medicinal and culinary purposes and in perfumes. Cultivated for at least 3,000 years, the seeds have been found in Bronze Age ruins on the Aegean islands and in tombs of the Pharaohs. Ancient Egyptians called it the spice of happiness and used it as an aphrodisiac. An essential oil is distilled from coriander seeds, which is sweet, spicy and strong. Coriander is warming for the body and can help to warm aching, tired muscles. As an essential oil, coriander is stimulating for those in tired states of mind. In states of tension, fatigue and nervous weakness, it uplifts and refreshes. As an aphrodisiac it is warm and exotic. We simply take the leaves, chop them finely, and add them to the product. Lush uses fresh coriander leaves in Brazened Honey face mask for the stimulating action on the skin, increasing the circulation, which helps eliminate toxins. It is also warming and refreshing.